The Cowboys made a huge splash this season by wearing a different uniform combination for every game. Turns out it worked for them as they won their first Big 12 title and are headed to the Fiesta Bowl on Jan. 2. I always preferred the normal white helmet with orange uniform, but at least the Cowboys showed a great effort this season for uniforms, and it’s hard to argue with the success they had in them. The best part about the changes was they did not abandon the primary OSU logo or introduced new colors into the scheme. Maybe it’s because the Bears got a little more exposure this season with Robert Griffin III, but I just began to notice how good the primary Baylor uniform looks. The combination of the gold pants and helmets with the green uniforms is very clean and neat. Nike even introduced a new uniform line for the Bears before the season. 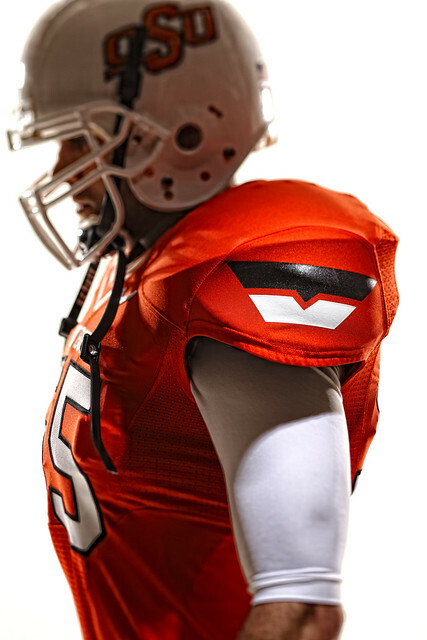 The Alamo Bowl uniforms were a bust, but I can forgive them. The Aggies don’t try to get too flashy with their uniforms, and that works for them. Maybe it’s because my elementary school wore maroon, but I find the combination of maroon and white to be very cool. The logo works because of the big T that is complemented by the A and M around it. My favorite is when the Aggies host Texas and wear all maroon. These are classic college football uniforms. Anytime you see burnt orange, you immediately think Texas and that shows the uniform has done its primary job of identifying a team. The orange is complemented nicely by the white helmets, and the road all-white look is a solid one. Again, these are classic uniforms. 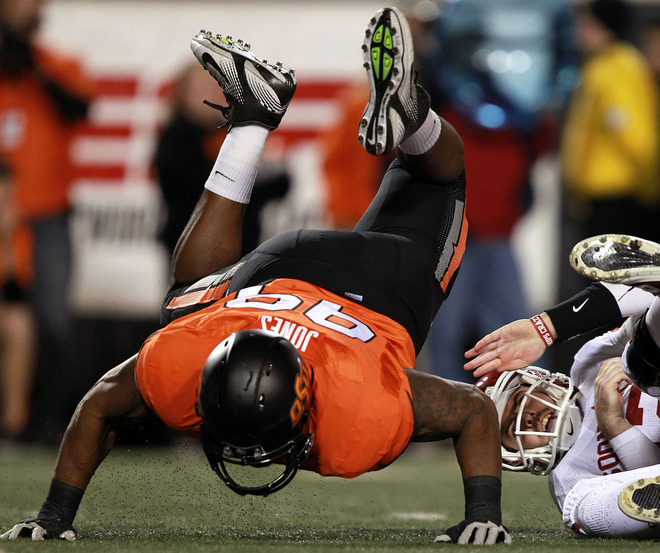 If there was ever a change with the Sooners’ uniforms, I’m sure there would be a riot throughout all of Norman. There’s really not much to the uniforms, but since they have been around so long and are iconic in college football, they get a decent ranking here. 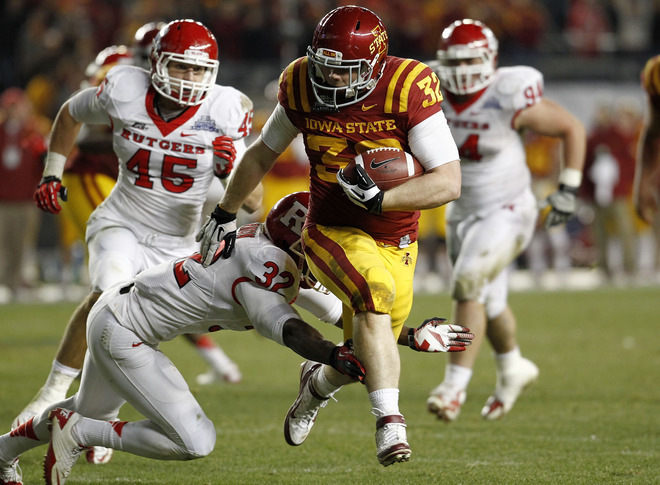 Recently, the Cyclones have gone to a retro look that certainly works for them. The combination of red with yellow pants is a nice look and the stripes along the shoulder are nifty, but it’s still a somewhat boring look. If the helmets could improve here, perhaps they would move up in the rankings. The Tigers have a decent uniform, but there is simply too much going on with all the trimming in the uniform. Plus, the helmets are pretty boring. Again, there’s too much going on here, even more than Missouri. The lines that go up the shoulders are unnecessary, it’s far too distracting for a football uniform. There’s not enough going on here. The purple with the silver is very boring. The part about this uniform that gets me the most is the logo which has been around forever, but could definitely use some work. Yawn! Could that helmet get any more boring? The Jayhawks aren’t even trying to do anything smart with the KU. They’re just written on the helmets. Much more effort is needed here.